Real Techniques are obviously the favourited brand of bloggers, I actually discovered them through blogging and Youtube. 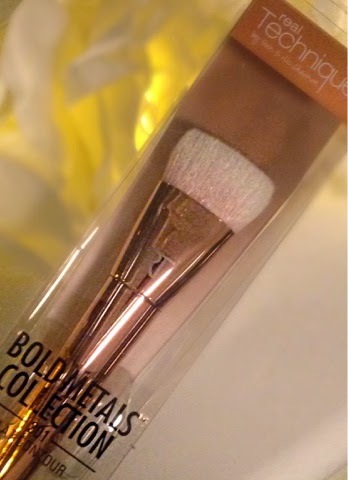 Being a big fan of their brushes and even a bigger fan of Rose gold I really wanted to purchase one of their new products from the bold metallics collection. These are not cheap brushes and so I could only really justify one from the collection, I thought I'd give the countouring one ago as at the time I had no real brushes for it. The Colour of this brush really drew me in, seriously I was like Abu from Aladin when he grabs the Ruby in the Cave of Wonders. But maybe I set my expectations too high. The Brush looks perfect.It has dense bristles, a long handle and a flat shape. I was fairly certain it would be perfect as an ammature to contouring. The brush can be used to apply creams and powders, initally I bought it for my cream concealers to create sculpted cheeks with a swoop of a brush. However, like the shape of the brush I found it left me feeling rather flat. I tried to apply the cream contour in several ways, first I put it on my face in a dabbing motion straight from the stick and tried to blend it out.... didn't really work. Then I applied it to the brush to put on my face, slight improvement but still not the desired look. Using the darker concealer I tried to create the line under the cheek and then blend it around my temples using the brush, didn't work too well either. So I was not having much success with the brush at all. Which peeved me off a bit considering the price. Although I hadn't bought it for powders, I thought I better give it a try so at least I could use it. Recently I bought the Bobbi Brown Shimmer Brick in Rose Quartz, and if you saw my youtube video I mentioned the pigmentation wasn't as strong as I had hoped it to be. This brush however made me change my mind ( which is hard to do) using it to apply the blusher as a highlight works really well. The blush becomes much more concentrated and the beautiful colours become much more prominent on the face. The bolder lines looks fab and makes a great highlight. The Brush works really well with powders but with creams not so much. I'll be keeping it as a blush highlighting brush but I wouldn't recommend purchasing it. Although its good with some products it's not great with all and for £22 I would want it to be good with all. 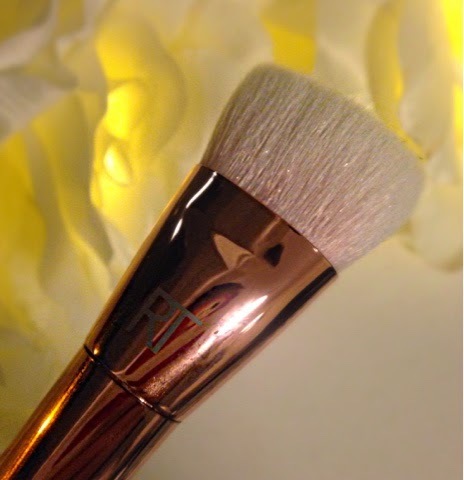 I love the real techniques contouring buffer brush for the Creams so go check that out! A lot more affordable, even if the packaging isn't quite as nice!